The beautiful drive to the trail. The author’s 1st Gen Tacoma stretching out on Jake. 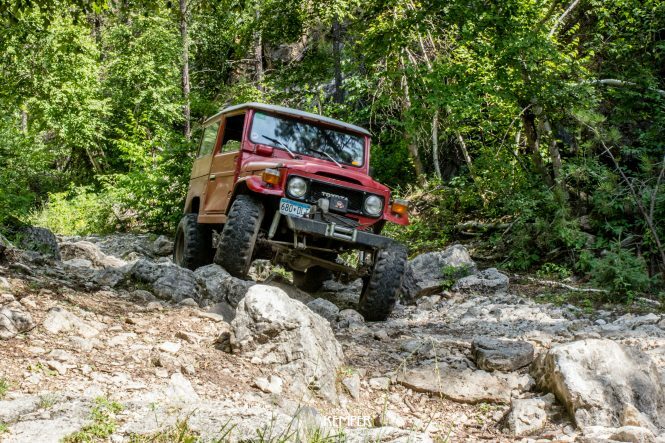 Tedd Olsen drove is FJ40 all the way from Minneapolis to attend BHCC. Dave and Alex Woodmansee negotiate the rocks on Iceman, proving good you really can take it with you. The scenery from the trail is spectacular. A “sleeper” Colorado 4Runner navigates the trails. Equipped with lockers, 33’s BFG’s, Marlin Crawler behind the 5-speed and a TRD Super Charger, the owner proves that driver skill is critical. Kemper’s and Coffey’s post for a picture. Mike and Megan venture out site-seeing in Mike’s beautiful FJ40. Jeremy demonstrates the function of his Crux Off-Road ladders. Pinion Falls on Jake offer an opportunity to test off-camber comfort levels. Dave Woodmansee demonstrates the value of his All-Pro APEX rock sliders. Dave sneaks his Tacoma through the Rocks. Dan grabs a ride across the water. Cave on the side of Little Johns. Rumored to be fairly deep (the author is a bit claustrophobic), it is a popular location for shenanigans. Always pass on the right. Little John – an outcropping of Hal Johns – offers opportunity to play on larger rocks. Jeremy lifts a tire on Little Johns. Perry negotiates the rocks in his “wife’s” 4th gen 4Runner. Nebraska farm truck – All-Pro SAS, Marlin Ultimate, 22re, 35” MTR’s and owner built flat bed. This truck performed flawlessly. Jeremy negotiates rocks. Who says IFS can’t wheel? Little John’s offered a number of opportunities to stretch the legs. The infamous Minnesota Toyx4 picture board, posing next to Kemper’s LX450, provides some visual history of the club. Originally put together for the Minnesota 4 Wheel Drive association, the board shows signs of wear… but the falling pictures give it character.